Alspaugh Kitchen and Bath began this bathroom renovation with a simple equestrian for a “just-for-her” space with plenty of storage. To achieve this goal, double sinks were removed in favor of a single sink. A small closet was replaced by a tall angled cabinet for storage of extra linens. Sharply angled walls presented a challenge. The designer’s solution was to remove an awkwardly placed door and a seldom-used tub. 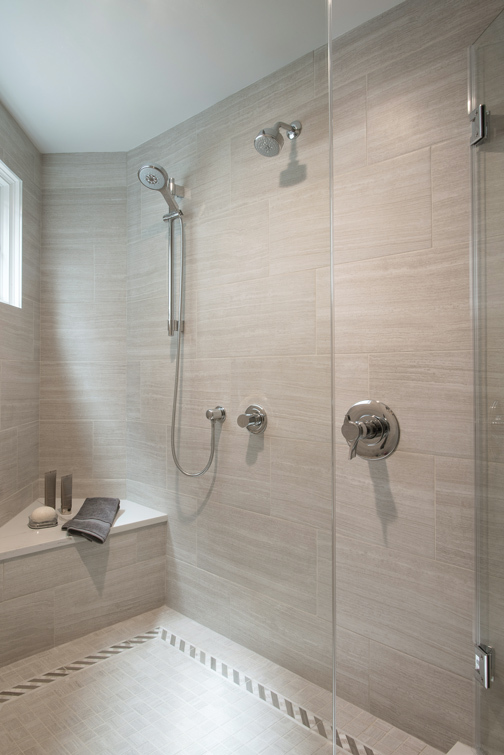 This created a more useable space with a larger shower. Custom cabinetry in a rift-cut oak provides a soft, neutral look. Mid-height cabinetry anchors the floating sink cabinet and drawers. 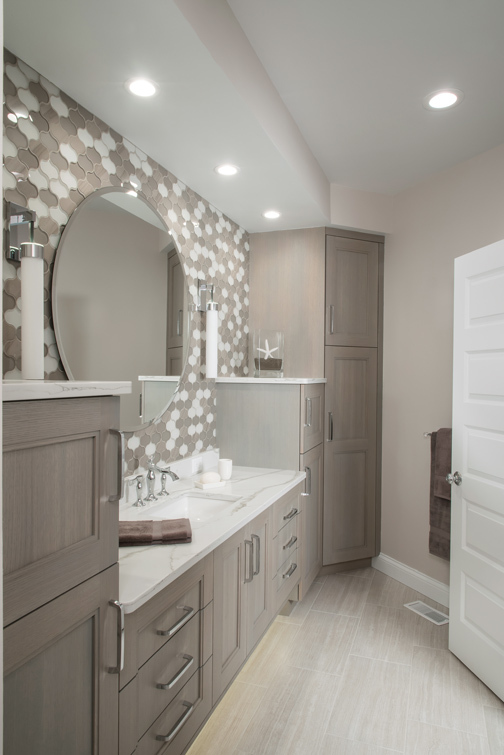 The wall behind the sink features a stunning Arabesque pattern of glass and stone tile. Sleek sconces function as decorative accents that deliver even light across the face. Large-scale porcelain tile covers the bathroom floor. The same large tiles line the shower walls, wall-matching mosaic tiles adorn the shower floor. A mosaic stone listello outlines the shower’s angled shape around the shower floor. The spacious shower also includes a seat, a new window with enclosed blinds, a niche for shower products and a hand-held shower. The designer had a difficult space to work with, but they made it function well. There is lots of storage for the awkward shape, and the material selections are beautiful.